sunflower seeds | "blackberry-eating in late September"
Last week I told you about my favorite new dip. White beans, toasted almonds, the piney sharpness of rosemary, the heady perfume of orange zest… and promised to provide a vessel on which to deliver this deliciousness to your eager taste buds. N. and I discovered shortly after my first foray into this creamy blend of balanced spice that the ideal vehicle for consumption was not in fact a spoon, but the best crackers ever: Trader Joe’s Raisin Rosemary Crisps. In fact, these are good not just as a vehicle, but a snack in their own right. Every time I went to the pantry to retrieve a few for dip spreading, I’d find them gone, thanks to N.’s voracious nibbling. I wondered at one point, as I broke down yet another cracker box for recycling, how difficult they would be to make myself. 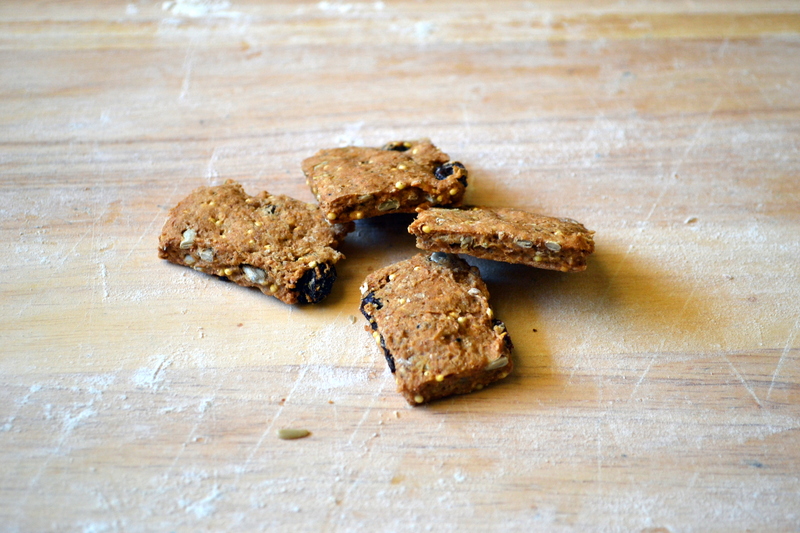 I’ve never made crackers before, but looking at the list of ingredients – sunflower seeds, millet, raisins, baking soda – it seemed doable, and further, thanks to the kind of collection that happens in established kitchens, when you don’t remember why you have something like toasted millet or roasted ground flaxseed but you just do, I had every single dry ingredient in my pantry, waiting to be used up so they didn’t have to make the move to California. On that door dividing me from opportunity, he was pounding with a brass knocker. Whisk together all ingredients except buttermilk until seeds, nuts, and fruit are evenly distributed. Add buttermilk and cut in with a fork or pastry blender until dough starts to lump together. It will be roughly the consistency of biscuit or Irish soda bread dough. At this point, switch to your hands (the best tools, really, aren’t they?) and knead the dough for three minutes or so, until it all comes together and becomes a bit less shaggy. You can either dump the mixture onto a lightly floured board to knead it, or you can be lazy like me and knead it in the bowl. At this point, you have a choice. If you want flat, rectangular crackers like Ry-Krisp or Stone Ground Wheat, roll out your dough into a big thin rectangle (1/8 inch thick or even less, if you can) and cut gridlines along your dough with a pizza cutter. Create whatever size squares, rectangles, trapezoids, or polyhedrons you desire, then place them close (but not quite touching) together on a baking sheet lined with parchment paper or sprayed with non-stick spray. Slide them into a preheated 300F oven for 45 minutes. You’ll end up with crunchy crackers with the slightest bit of give in the center, evenly colored with a dense crumb. They are a little like miniature flatbreads. If you want slightly lighter crisps with a darker “crust” perimeter and a sprightly, Panko-like crunch, there is only one inspiration to which you can look: biscotti. I liked the flat crackers. I did. They were tasty, they were good with the dip, and they were relatively quick: roll, cut, bake, done. But they weren’t the ephemeral cracker experience I was after. If you’re going the biscotti route, once the dough is kneaded together well, divide it in thirds. 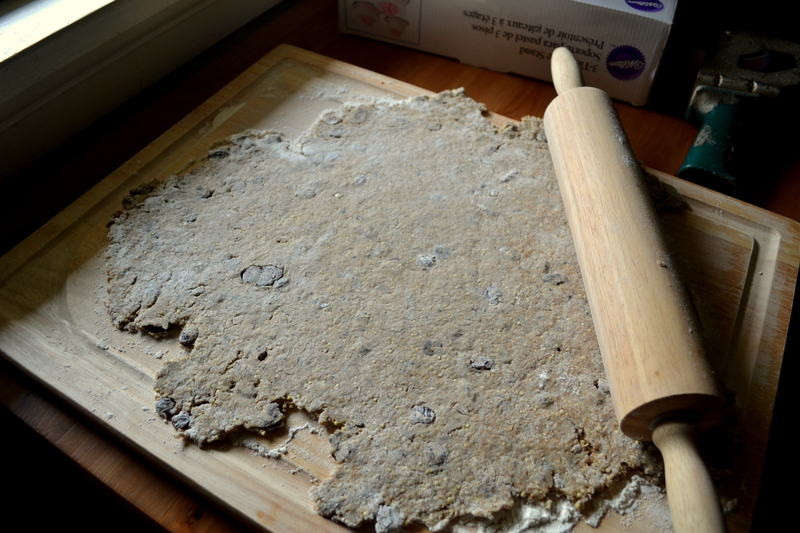 Instead of rolling it out on a board, roll it into a long, thin “worm” of dough on some plastic wrap. 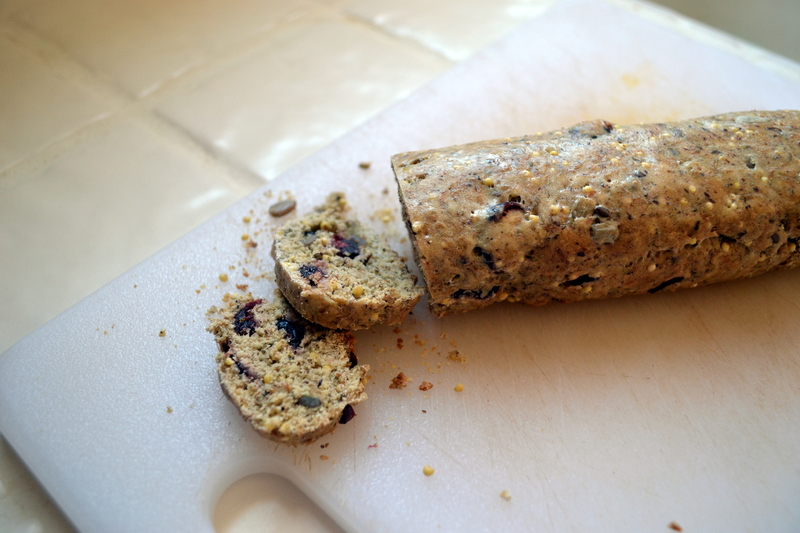 Press, squeeze, and moosh it into a log of even thickness, using the plastic wrap to help you. Wrap up securely in the plastic, then pop it into the fridge. Repeat with the other sections of dough, each in their own piece of plastic wrap. Refrigerate for at least three hours (my trusty biscotti recipe from which I estimated times and temperatures says you can leave them in the fridge for up to three days). 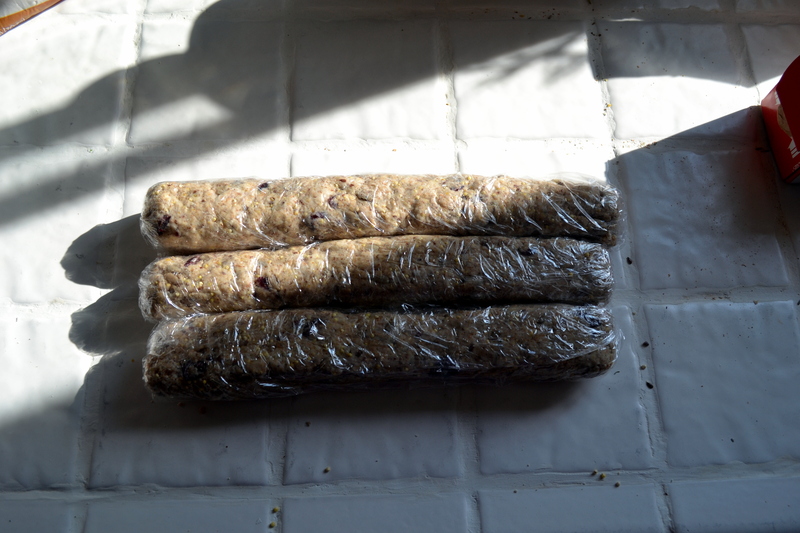 When you are ready to bake, take the worm/logs out of the fridge and unwrap. Leaving them sitting on the open plastic wrap, paint them lightly with buttermilk to encourage browning. You could probably paint them with egg wash too, but the TJ’s box doesn’t list egg as one of its ingredients… Carefully move the buttermilked logs to a baking sheet, then place in a preheated 325F oven for 30-40 minutes, or until the tops have swelled and are lightly golden. Let them cool completely. You will find when you move your logs that the bottoms are browner than the tops. 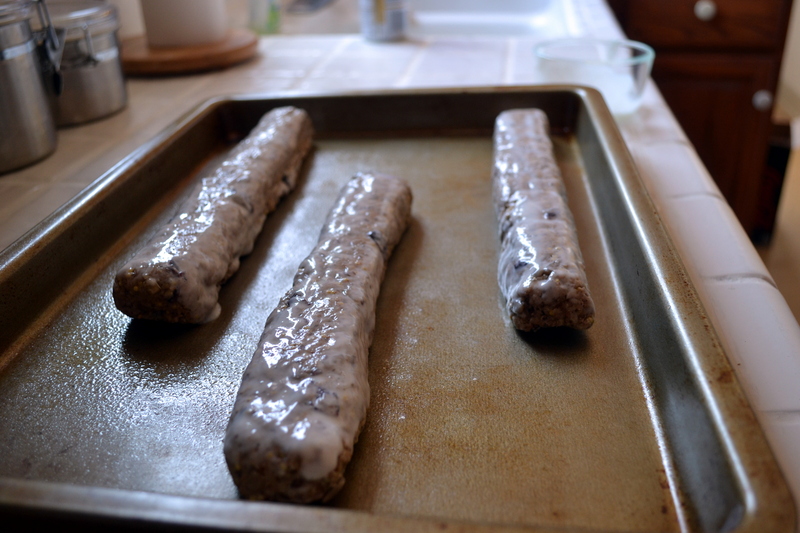 I am toying with the idea of slowly rolling these logs as they bake so that each side comes in contact with the metal of the baking sheet for ten minutes or so during the baking. This might make the finished logs a bit more rectangular (and hence capable of producing square crackers), and it might make each edge evenly brown. Let me know if you try it out, and I’ll do likewise. When the logs are cool, carefully cut them into thin slices with a serrated knife. Some of mine crumbled a bit, especially when there were craisins at the edges of the log, but that just meant more sample scraps. My ideal would be 1/8 inch thick or even thinner, if you can manage it. But really, what you want here are crackers of the thickness you want to bite into. Position your slices on a baking tray in a single layer (it’s fine if they touch each other, as long as they aren’t in layers) and bake in a preheated 300F oven for about 20 minutes. The edges will bronze a bit deeper, and the centers will flush golden brown. 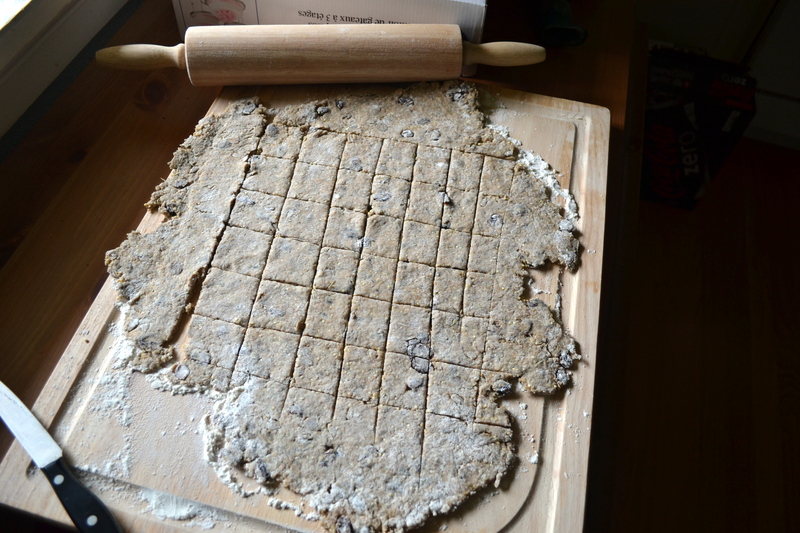 They won’t feel quite crunchy yet, but take them out anyway: much of the crisping happens as the crackers cool. In an hour or so, when they are cool and crisp, I recommend you slather them with my almond white bean dip, or maybe a thick slice of rich brie, or some sharp, tangy goat cheese, and consume. 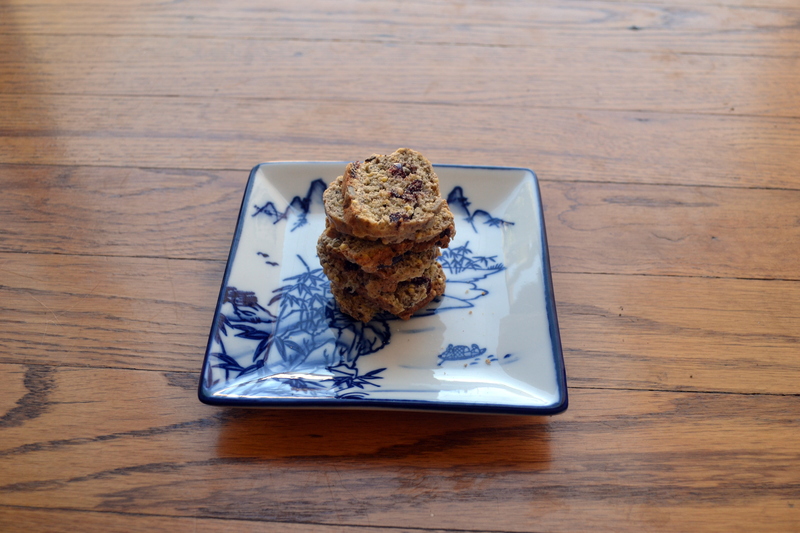 They are deep and toasty in flavor, the nuts and seeds lend appealing texture and different kinds of crunch, and they are just barely sweet from the brown sugar and the craisins. 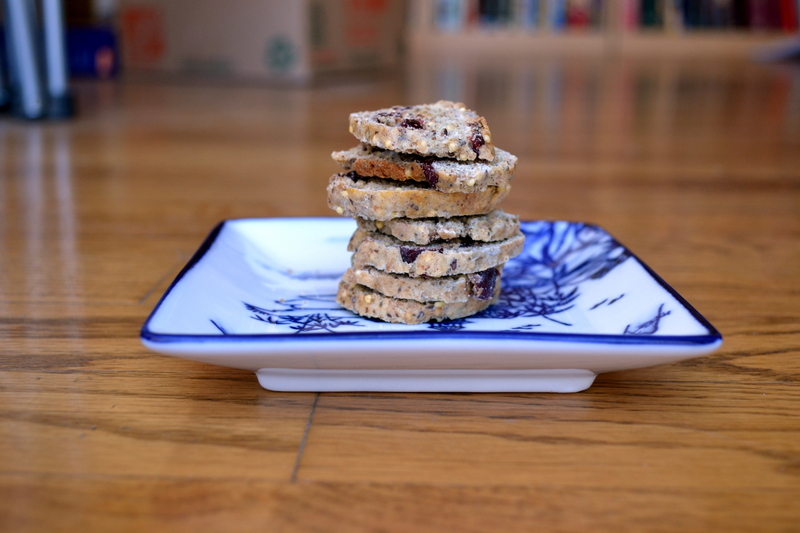 I like the switch to cranberries as the fruit source, because they pair so nicely with the orange zest in my dip, but also because their uncompromising tartness makes these crackers interesting enough to eat all on their own. Enjoy!